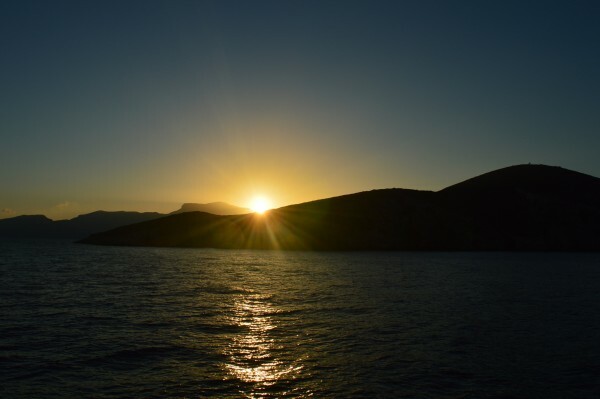 Day three of my week-long trip with Mediterranean Delights Fitness Voyage began with another early start in order to make our way to the Turkish district of Datça. 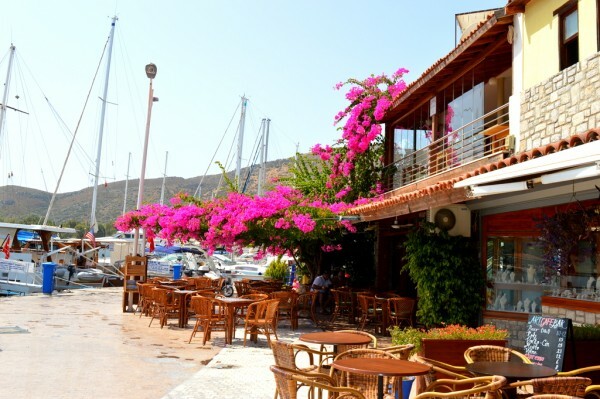 Datça sits in the south-western region of Turkey in the province known as Muğla. 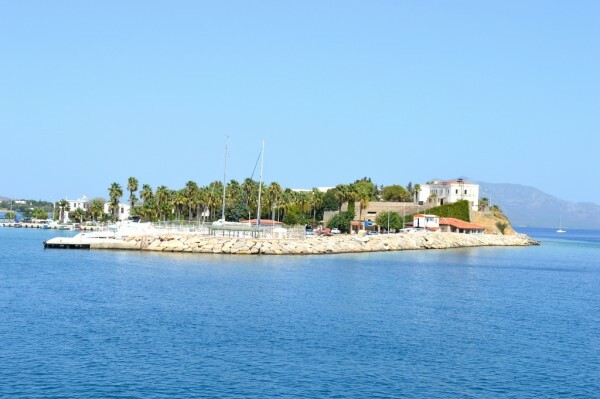 The centre of Datça lies right in the middle of the Datça peninsula, both of which were for a time known as Reşadiye in honour of Sultan Mehmed V Reşad. 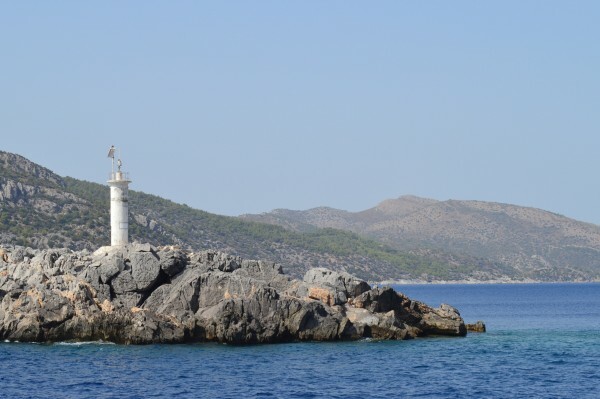 The journey from Symi did not take very long but was, as had always been so far, pleasurable and relaxing to enjoy beneath the warmth of the September sun. 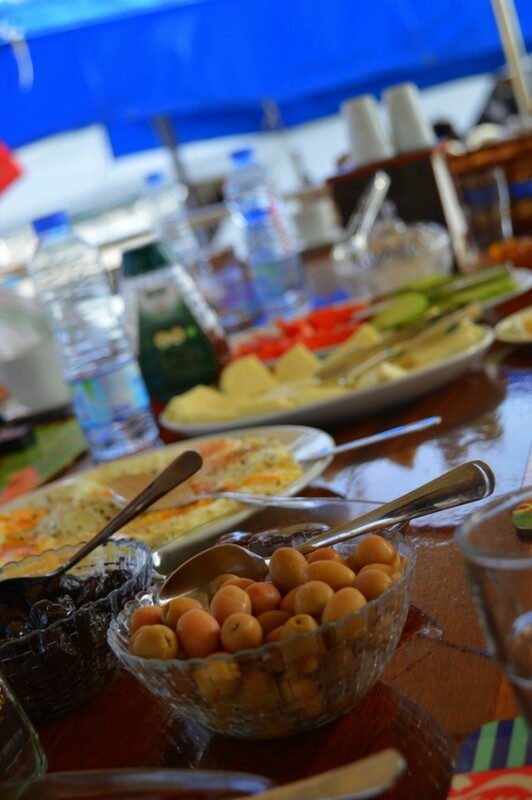 Breakfast would be served on board our vessel, the Muhteşem-a gulet, once we had anchored at the the Datça harbour. 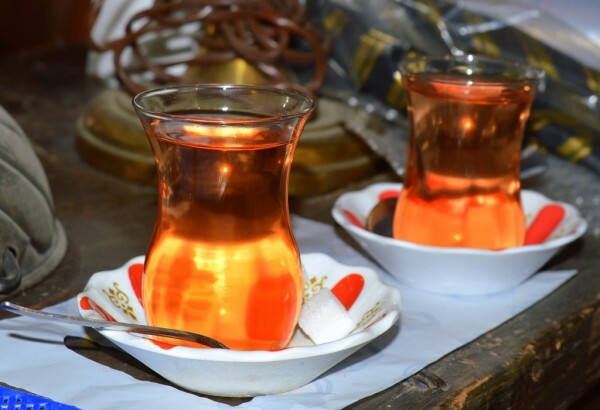 A banquet of eggs, feta cheese, olives, fresh tomatoes and cucumber and baskets of bread accompanied by dishes of the sweetest honey and jam were laid out for us along with fresh fruit juice and steaming hot cups of tea and coffee. Once breakfast was over it was time to set foot upon the Turkish shores. Before our trip with MDF Voyage began we were required to arrange a visa in order to be granted permission to enter and travel in Turkey. Applying for a Turkish visa is now very simple and can be done online through the Turkish e-Visa system. 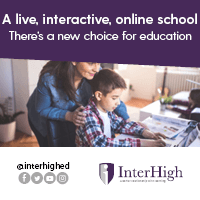 The application process took a matter of minutes to work through and once completed and the nominal fee is paid (dependent on where you are applying from and what you are applying for), a link is emailed to you for an immediate download that you can print off. I paid a total cost of $20.70 – twenty dollars covered the cost of the e-Visa while a small service charge was added onto the fee. The e-Visa is then valid for a total of six months of your chosen start date (note: that is not the date that you apply for your visa but the date from which you state you want it to begin from). Included in the stop-off was a visit to a local hamam – a Turkish bath. This is where you would be willingly stripped down in a steaming hot room and pummelled to within an inch of your life by a complete stranger until your old skin leaves your body in a quest for freedom. If you listen carefully you can almost hear it screaming ‘Anything but this!’ as the old cells make their sud-ridden, loofah-bound escape. You then emerge refreshed, renewed and hopefully not traumatised for life. Or that’s the plan, at least. Not in the slightest bit tempted by such intimacy I opted instead to take the few hours I had to take in as much as I possibly could of this beautiful land. 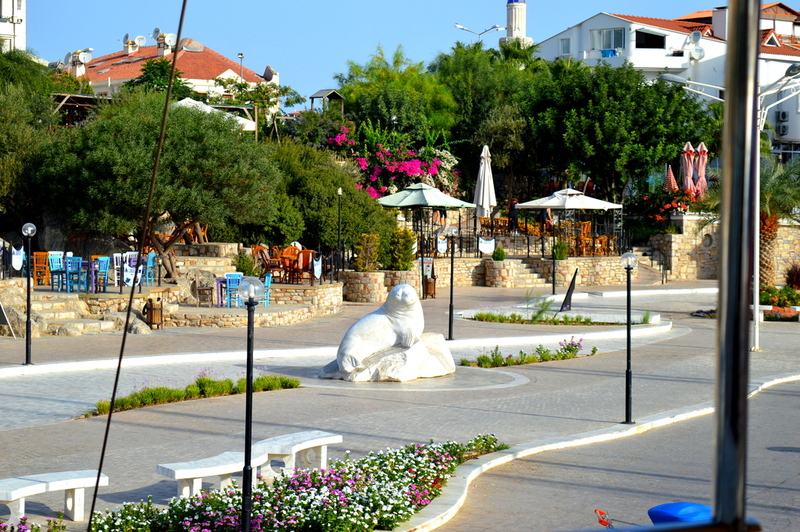 Visitors to Datça won’t fail to notice the huge marble statue of a seal situated at the harbour. 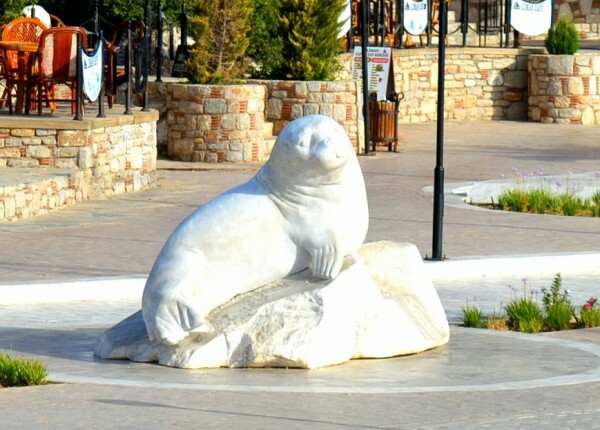 The statue is not just any old seal but the area’s star Mediterranean Monk seal known as Badem. Badem was originally found as an abandoned pup in the Turkish resort town of Didim, part of the Aydın Province on the Aegean coast of western Turkey back in 2006. She was weak and extremely close to death but, thanks to the care of the Mediterranean Seal Research Group and the Underwater Research Society (SAD), she is now a strong and healthy seal weighing in at over 150 kilos. With fewer than 100 Mediterranean Monk Seals around the Turkish coast and less than 400 worldwide, Badem’s recovery was certainly reason for celebration. What better way than by erecting a marble statue in her honour? Despite my mum being Turkish and my parents being born and raised there, this was my first visit to the country itself and something that I had been looking extremely forward to. I quickly realised that the small handful of hours we had wouldn’t allow me to see or do very much at all. 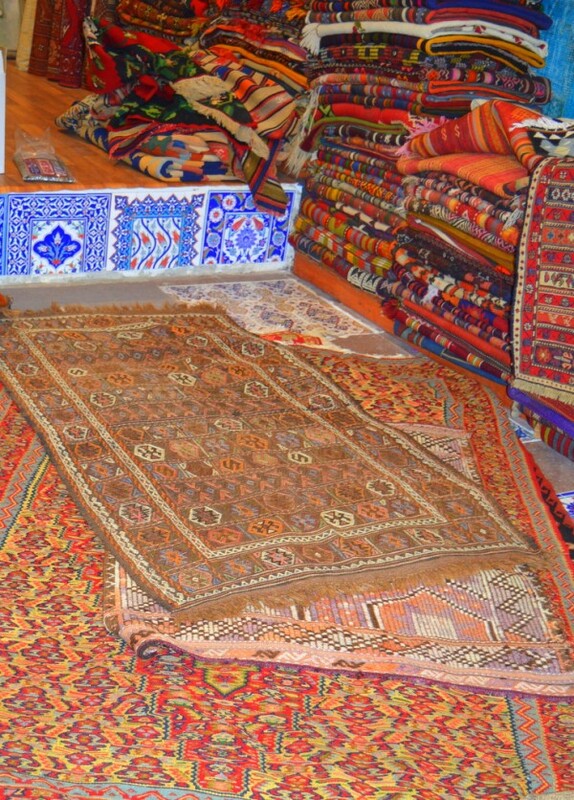 1) I wanted to look at Turkish rugs and fight the urge to buy one. 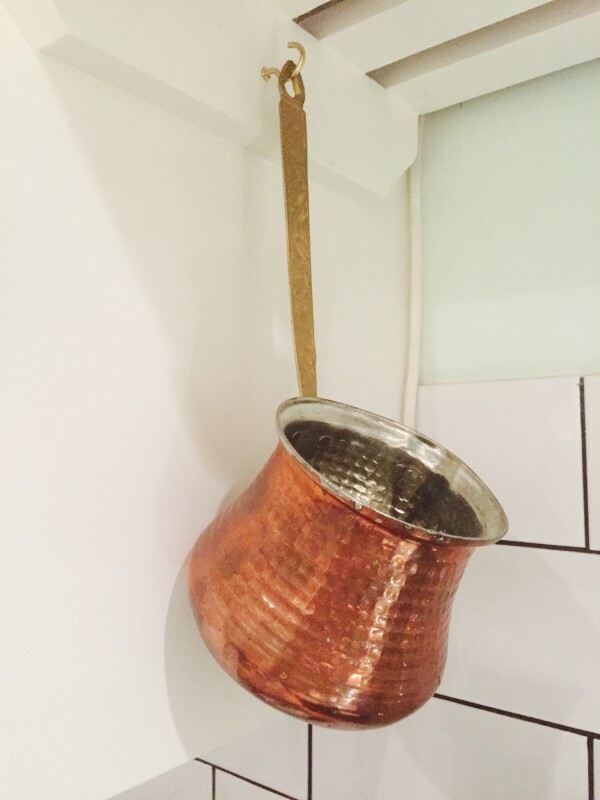 2) I wanted to find somewhere that sold Turkish coffee pots as the one we have at home is quite small and years old. 3) I wanted to drink a real Turkish coffee in a real Turkish cafe. At home we have one or two cups of Turkish coffee daily. Turkish coffee is served in small cups rather like espresso and, again similar to espresso, is served without milk or cream. 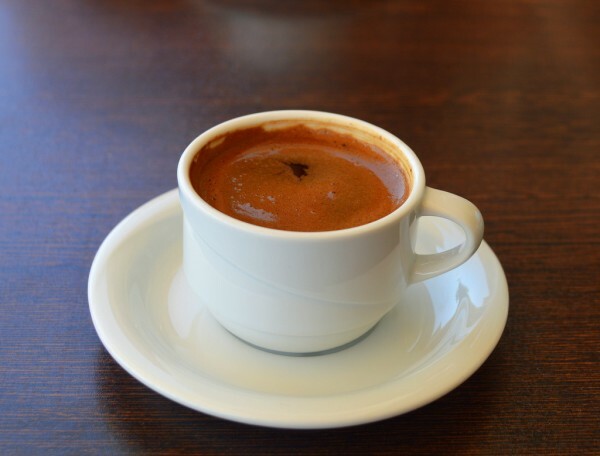 I don’t know whether it’s because I am so used to Turkish coffee having been familiar with it from a very young age but I tend to prefer it over espresso, finding it less harsh and more palatable on the taste buds. A real Turkish coffee in a real Turkish cafe. 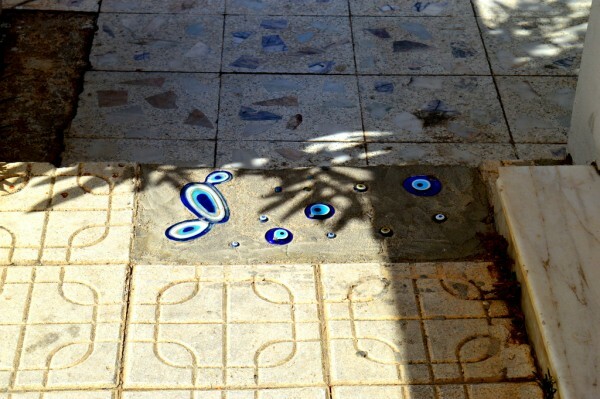 Wandering around Greece and Turkey you cannot fail to notice the constant presence of blue and white charms. These talismans, called nazar boncuğu, were created to protect a person against the curse bestowed upon them by way of a vicious glare and are known as ‘evil eyes’ – as is the curse itself. 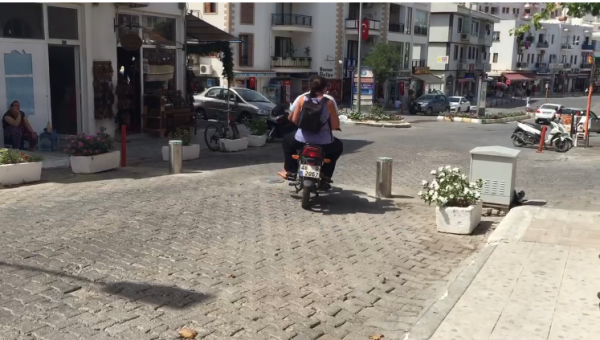 It isn’t unusual to see them everywhere… including pavements! Evil eyes that protect you from the… erm… evil eyes. The severe lack of time meant that I could only visit two streets, one of which was the main harbour-front below. The cafe I visited sat at the corner and so I decided to take a walk alongside the harbour and around to the street behind. Even the lack of time didn’t prevent me from enjoying the display of the beautiful bougainvillea against the stunning blue sky. Some things in life just shouldn’t be hurried. This was one of them. 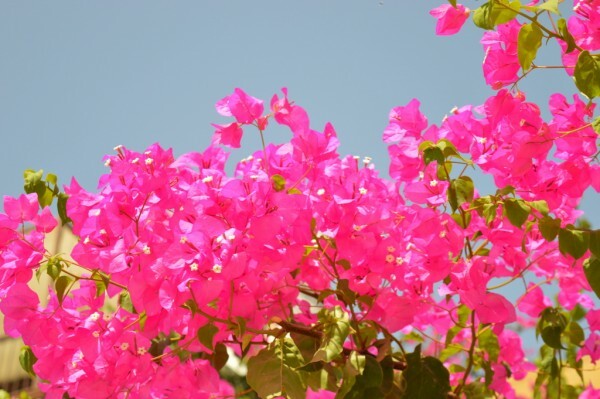 The pinks of the bougainvillea against the bright blue of the sky. Nature at its finest. As we walked around from the harbour-front several middle-aged men sat beneath the shade of a tree and greeted us. 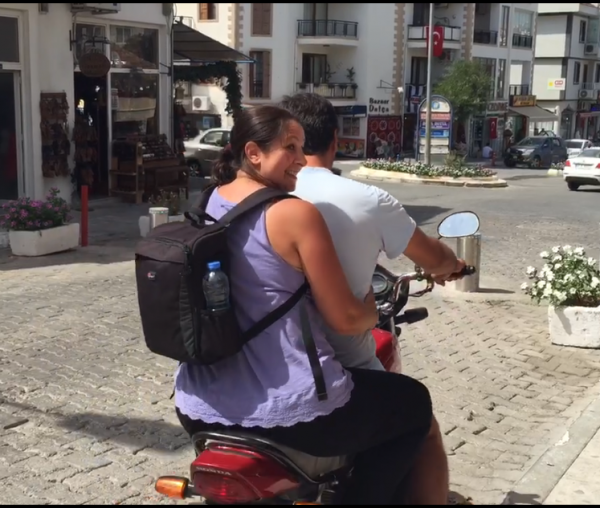 We stopped to ask if they knew where I could find a cezve (pronounced ‘jezVEH’), – a Turkish coffee pot. One of the men broke away from the others and led us to one of the first stores on the street behind. 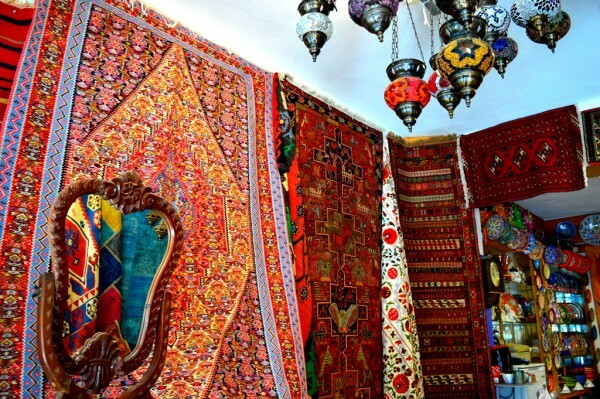 The store wasn’t particularly large but it was packed full of rugs. Big rugs and small rugs in a fantastic range of colours and designs surrounded us. Dozens were hung upon the walls and hundreds more were folded and stacked neatly in pile after pile along the sides of the store. The detail in each of the designs were truly amazing. I had already joked about returning home with a Turkish rug but I really wasn’t joking any more. This was one I had fallen in love with. 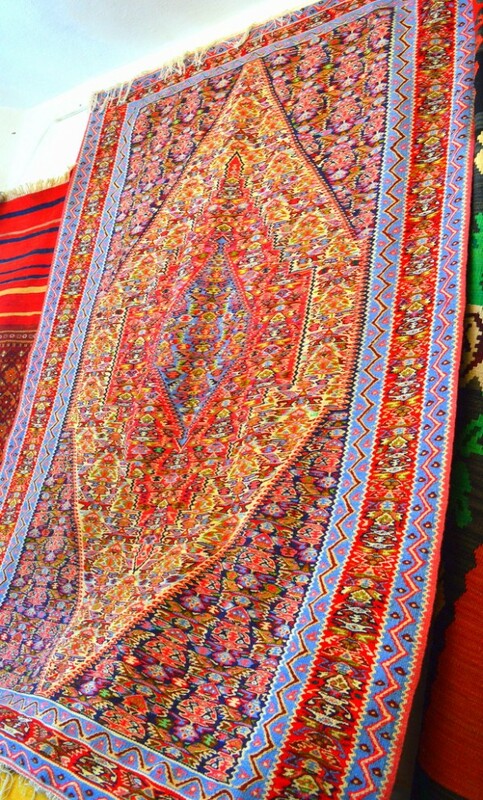 I fought the urge to buy the rug I so fell in love with – the price for shipping and all was a bargain but I ummed and aahed for far too long and ran out of time in the end. I have regretted it ever since. We chatted for a while with the owner who had insisted upon making us a cup of traditional apple tea which was absolutely delicious. As we chatted his friend who had led us to the store in the first place once again mentioned my quest to find a new coffee pot. The shop owner walked over to the door and asked me whether I rode bikes. ‘I rode one for the first time in years…’ I began to say, automatically assuming he was talking about a pedal bike. I’m a forty-something mum-of-13 whose core strength would probably be defeated by an apple if we were to ever compete. 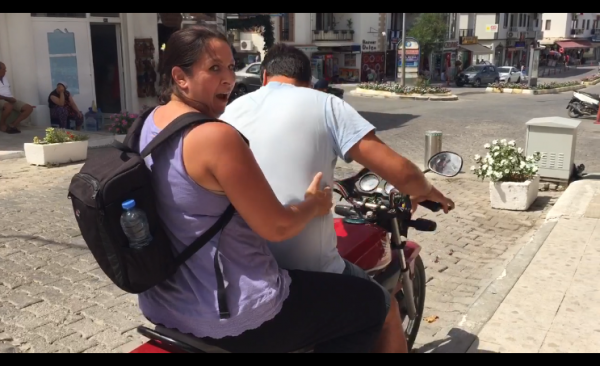 I had never ridden pillion on a motorbike before, let alone with a stranger in a country I had been in for all of two hours – a country whose drivers seem to resemble track racers from Mario Kart. Did I look completely crazy? As he speeded away with me wondering what on earth I had let myself in for, a rapid succession of thoughts went through my head. Where was he taking me? I didn’t have a clue. What if he was a madman and was kidnapping me? Would Mike ever be persuaded to pay the ransom? I didn’t hold out much hope that he’d think it a worthwhile investment. What is the appropriate strength with which to wrap your arms around a complete stranger when you’re trying to hold onto him for dear life? Is this too tight? Not tight enough? I mean, how does the intimacy scale go in cases like this? Where was my helmet? I mean where was my helm… oh my goodness, did you just SEE that van pull out and oh-my-God-that-roundabout-is-way-too-small-to-circle-around-without-defying-some-law-of-physics! I got my coffee pot. Thank you, Serin Sanli. 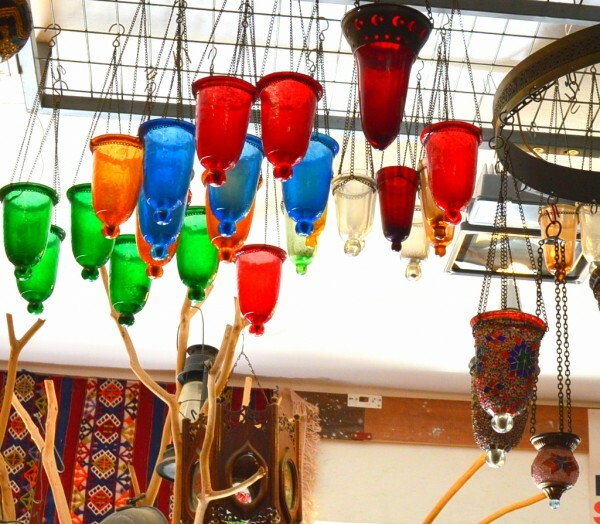 If you’re in Datça do stop by his store at Ottoman Souvenirs, Isekele Mah. Yat Limani No 69/B! With recklessness for the day crossed off my list it was time to board the Muhteşem-A once more in order to head off to view the ruins of Knidos. 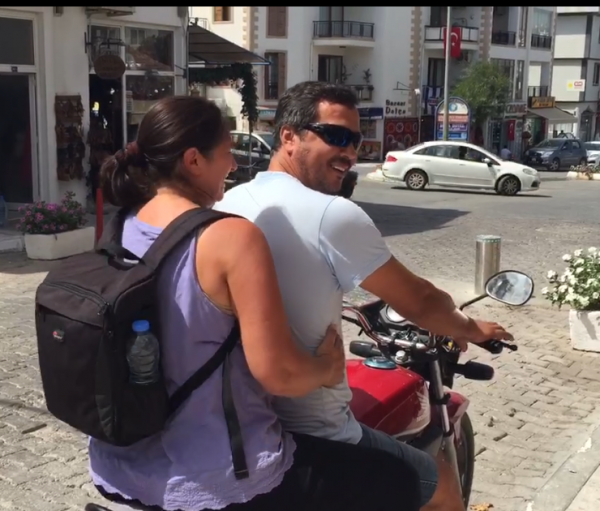 If there was anything I wished were different about the trip so far it would have been the severely limited time at Datça. I would have loved a few more hours to explore more, to see more and to do more. It was so quick that there didn’t seem time to do hardly anything. A few more hours would have been good but regardless, my mind has been made up. 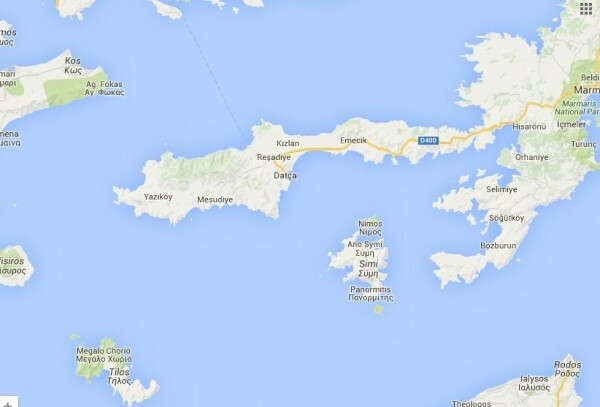 Another visit to Datça is definitely on the cards for me. 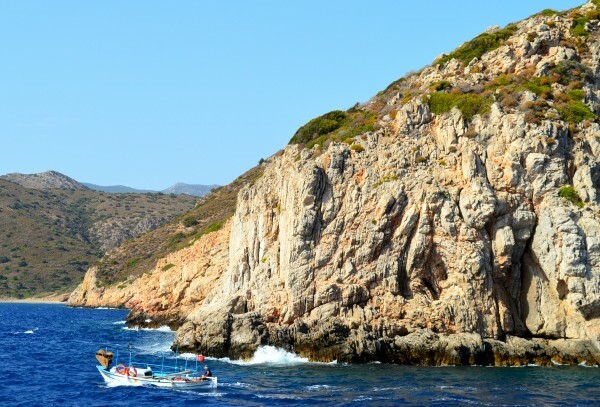 After another delicious lunch we set off for the short journey to the Port of Knidos passing by many coves etched into the rocks by years of tides and weather. Knidos was an ancient Greek city situated on the Datça peninsula in the south-west corner of western Turkey. In 1858 an ancient Greek statue of a lion was found lying near the port by Richard Popplewell Pullan. Popplewell, a British archaeologist, did what British archeologists seem to have developed a habit of doing and took the statue back to England where it is now displayed in the British Museum along with other stolen and looted artefacts from around the world. 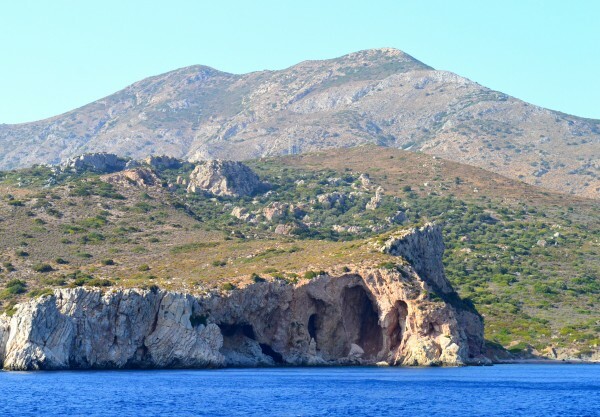 Nobody gave permission for the Lion of Knidos to be taken and the museum is refusing to send it back despite the town of Datça petitioning the British Ministry of Culture and Tourism for its return. Anyway, back to the history. 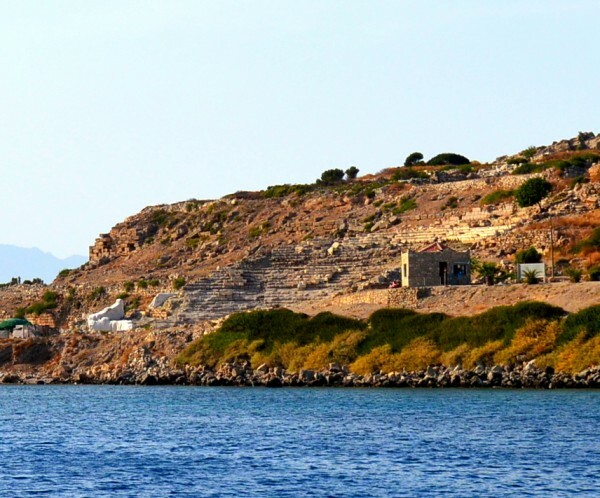 The Dorians originally founded a colony on Knidos at around 400BC. Its location leaves it open to the elements and so can be quite a windy cape to navigate. 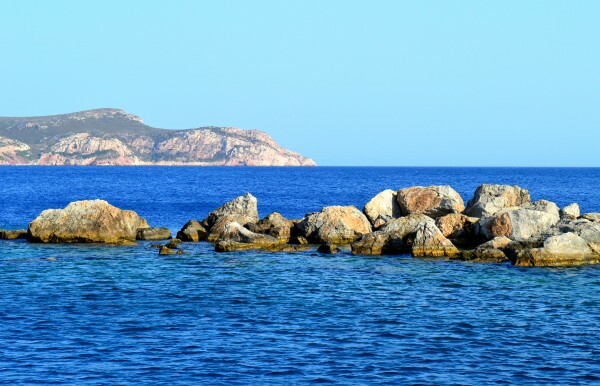 Knidos was the home of the Temple of Aphrodite which is thought to have been the place where the statue of Aphrodite once stood. The statue was created by an ancient Greek sculptor from Athens by the name of Praxiteles in 4BC. The story goes that he created two statues, one clothed and the other naked, which he offered to the people of Kos. 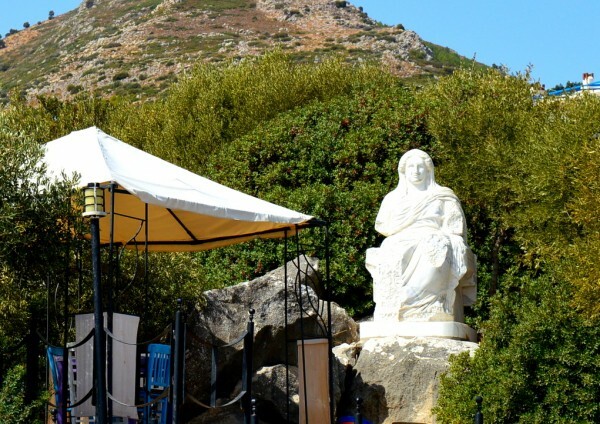 Embarrassed by her lack of modesty they chose to purchase the clothed statue and so the naked Aphrodite was purchased by the residents of Knidos instead. While many reproductions have been created the original no longer stands. It is thought that she may have been moved to Constantinople (now Istanbul), but perished in a fire during the Nika riots of AD 532 which destroyed approximately half of the city in the course of a single week. We anchored off-shore, settling at the point where the Mediterranean and Aegean seas meet and so could only admire the ancient theatre from afar. I again found it unfortunate to be so close to a place with such great history and so much to see yet be so far from exploring it. 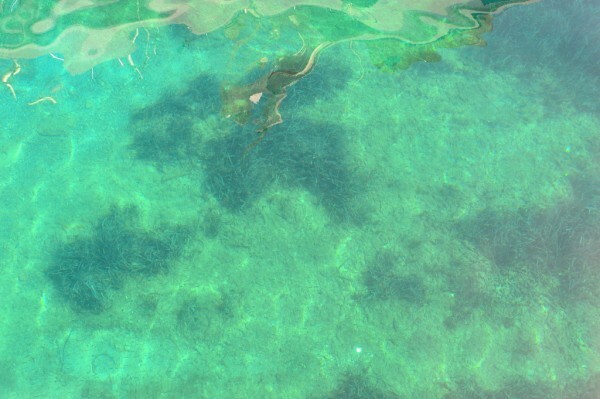 We did have the chance to explore the sea although I bypassed the opportunity for a swim this time. The waves seemed stronger, harsher and less forgiving than the warm waters of Symi the day before so I decided to enjoy the view from the deck as night fell instead. It is probably my highlight! It still makes me laugh.